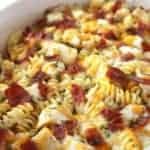 This Easy Chicken Bacon Ranch Casserole is perfect for a quick and simple dinner. We have pasta, chicken, easy Alfredo with ranch dressing, bacon, and of course, cheese. Whisk together alfredo sauce and ranch dressing in a medium bowl until combined. Rub bottom and sides of a casserole dish wirh butter. Add 1/2 pasta and 1/2 the chicken and top with 1/2 sauce. Stir to combine and sprinkle with 1/2 the cheese blend. Add remaining pasta and remaining chicken and top with remaining sauce. Sprinkle with remaining cheese blend and bacon. Cover and bake for 30 minutes or until cheese is melted.